For other places with the same name, see Darwin (disambiguation). Darwin is a small yet cosmopolitan city. People from more than 50 nations make up its population of 150,000. It is on the Timor Sea (a branch of the Indian Ocean) in north-central Australia. Darwin is the tropical capital city of the Northern Territory. Darwin has a relaxed lifestyle and unique multiculturalism, where people from over 50 different cultures live and work side by side. The regular Asian-style markets that form an intrinsic part of the everyday Darwin landscape for local residents sea food, music, language, and culture from just about every Asian nation, alongside "crocodile hunters", local Aboriginal artists, musicians of every genre, sports fishing operators, sunset sails, and families with children playing on the beach. 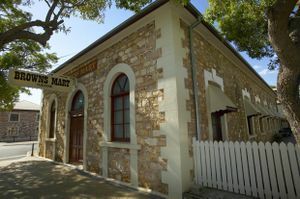 Darwin's unique cosmopolitan makeup has been recognised as an "multicultural icon of national significance" by the Australian National Trust. Darwin's tropical climate has two major seasons, the 'dry', from about May to October, and the 'wet', from November to April. Major cyclones have occurred approximately once every three decades. Much of the city was destroyed by Cyclone Tracy in 1974. Darwin was first named in 1839 by John Lort Stokes during the third voyage of the Beagle. It was named after his former shipmate and famous naturalist Charles Darwin. Darwin's development was accelerated by the discovery of gold at Pine Creek, about 200 km south of the city in 1871. After the gold rush Darwin's growth slowed mainly due to the harsh, tropical climate, distance and poor communications with other Australian cities. 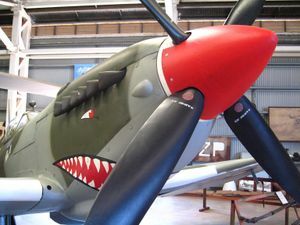 The Second World War put Darwin back on the map when the town became an important base for Allied action against the Japanese in the Pacific. The road south to the railhead at Alice Springs was surfaced, putting the city in direct contact with the rest of the country. 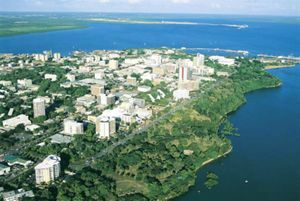 Modern Darwin is one of Australia's most cosmopolitan cities, more open to Asia than perhaps any other Australian city. It plays an important role as the door to Australia's northern region. Natural wonders such as Kakadu, Katherine Gorge, and Litchfield are all within driving distance from the city and still contain near pre-colonial populations of crocodiles, goannas, snakes and wallabies. 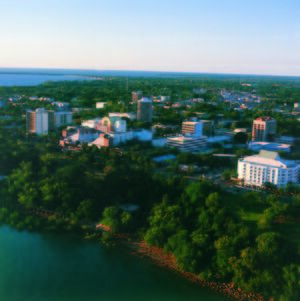 Today Darwin is a fast growing regional centre that has unique history, culture and adventure. The Top End, which includes Darwin, Katherine, Kakadu National Park and Arnhem Land, has a tropical climate. Darwin has an average temperature of 32°C (90°F) all year, with varying humidity. Darwin is climatically perfect to visit from May to October. There is no need to check the weather forecast as it is nearly always 31°C (89°F) and sunny during the day, with cooler nights. November and December the build up, or pre-monsoon season, begins and humidity levels start their rise. The summer rains bring the natural landscape to life and deliver the picturesque storms and sunsets the Northern Territory is renowned for. Some people enjoy this aspect of the wet, with the rivers and waterfalls in full glory, and the landscape greener. Jetstar offer direct flights to Darwin to and from Singapore, and flying from Asia or Europe to the eastern Australian capitals via Darwin is practical, and will often cost no more than flying direct. Darwin also has international flights to Bali, Manila, Kuala Lumpur, and East Timor. Darwin is easily accessible from most major Australian cities by several domestic carriers. There is a airport shuttle bus (tickets $18 one way), which meets all flights 24 hours, and taxis are available. There are limited public transport services to the airport. Bus 3 has two deviations (c) and (d) which service Charles Eaton Drive and Henry Wrigley Drive. Bus 3(c) services run at three times between 6:25 and 8:05am, one at 12:30pm Mon-Fri. Bus 3(d) services run at three times between 3:55 and 5:20 pm Mon-Fri. If you are travelling outside these times, it is still possible to catch bus 3, get off just after stop C (Jingili shops) just before the bus turns down Scales St, and walk the 2km down Henry Wrigley Drive to the Airport. Allow 30mins to walk there. Once you check in at the airport and go through security, there are free (hot) showers upstairs (turn right at the top of the escalators) to freshen up after your walk. Bus 3 is a circuit service starting and finishing at Casuarina Interchange (so you could also use this service to get from the airport to town). If you are travelling from the Darwin city centre, bus 10 operates from Darwin Interchange to Casuarina Interchange where you can then catch bus 3 to the airport. 0. Get money from ATM and make sure you have small bills (The bus cannot split; has only coins). 2. Go straight and follow the path. On the right side you will see the Pick up Area and then a little walkway through trees. You will end up on a street - You see buildings of General Aviation (front), exit of a parking lot (left), large street sign to Rydes Airport Hotel (right). Go along street (right). 3. Follow the street until Pederson Road - Along the walk you will see see Rydes Airport Resort on the right side. 4. If you want to use bus 3d then continue on the Pederson Road - Charles Eaton Street ends in Pederson Road. 5. If you want to use regular bus then continue on Street 1 (Wrigley Drive) until the crossing with traffic light. Along the way you will see Abala Road (road to a Sport Complex). 6. At this crossing exists a Petrol Station and a white sign "Jingli". Cross (go straight) the crossing with traffic light (McMillians Road; No names) . Then you will be in Rothdale Rd. 7. After Petrol Station (30m) exists on the left side a Bus Stop (Darwin to Casuarina). Opposite (right side) exists a bus stop and a bench (Casuarina to Darwin). Wait there up to one hour. For detailed timetable information and fares, refer to the Darwin public transport website . Darwin International Airport  is situated 13 km north-east of the city centre. There are direct flights to most Australian state capitals, Northern Territory destinations, as well as destinations in northern Western Australia. There are direct international flights to Bali, Singapore and elsewhere. Regional Link is a newly formed division of the NT aviation services company Capiteq Limited, whose other airline subsidiary is Airnorth. Regional Link offers numerous flights into Darwin from regional areas including Broome, Kununurra, Gove, Groote Eylandt, Granites, Maningrida and McArthur River. Regional Link also operates one flight a week from Perth via Kununurra. The Stuart Highway is the only highway into Darwin; heading directly into the city centre and extending southwards all the way to Alice Springs (about 1,500 km) and Adelaide (3,042 km or 1,886 mi). You can access Darwin from all the Australian capital cities staying on regularly trafficked sealed (bitumen) roads with regular services. The drive from Sydney or Perth is about 4000 km-4500 km (2485 mi-2800 mi)depending on the route you choose, plan your trip and your stops carefully. . The Ghan  is a tourist train that crosses the continent from Adelaide to Darwin twice a week. It is invariably more expensive than flying, but it is a journey for those who enjoy train travel, or who want to bring their car without the hassle of driving. There are transfers in Adelaide from Sydney, Melbourne and Perth. You can also transfer your car from any of these origins. 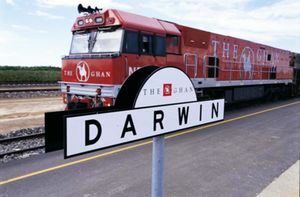 The train line to Darwin was built relatively recently, and was designed primarily for freight. The terminus for the train is near the deep water port at East Arm, approximately 7 km (4.5 mi) from the city centre; on the other side of Frances Bay, take a taxi, or get your accommodation to arrange a pickup for you. Buslink  provide a complimentary service for guests traveling in Gold class. For guests traveling in Red class, a shuttle bus service is provided. Tickets are purchased from the driver and no booking is necessary. Return services run from the Transit Centre on Mitchel St. There is no public transport to the train station. Cruising has increased in popularity in the Northern Territory and the schedules for several international cruises include a day stopover in Darwin. Expedition cruise ships touring the northern coast of Australia are becoming a popular way to visit remote Aboriginal art communities in Arnhem Land and Groote Eylandt. Cruise ship dock at Fort Hill Wharf, which is quite close the Stokes Hill Wharf by water, but it is a 2 km or so by road. It is around 1 km (0.6 mi) to the Esplanade, and 2 km (1.2 mi) to downtown. Driving is the best way to comprehensively see Darwin. Many of the sights are spread out, parking is easy and traffic is usually free flowing. Walking between attractions or from a bus stop to attractions, even in the inner city, can be very hot work for those not used to the Darwin climate. Dress to stay cool, and carry water. Cycling is another popular method to travel around the CBD, thanks to the flat geography and small footprint of the city. Casual cyclists are a common sight (and occasional hazard) on the footpaths, as well as the roads. While helmet laws are in place, they are rarely enforced. Tours are available, and tour coaches are available to some attractions. Darwin Beer Can Regatta - Wacky races which happen in the water at Mindil Beach annually in July. Berry Springs Nature Park is a popular and picturesque area for picnics and is a great swimming spot. Use goggles to spot native fish and other aquatic life that live in the clear pools. The picnic area is a good base from which to take a walk through the monsoon forest and woodlands. Bring your binoculars if you're keen on bird watching. Around 50 km south of Darwin, reachable in 45 min by car. It has a kiosk. It can be closed for swimming during the wet season. Casuarina Coastal Reserve Just a 20 min drive from the city, the Casuarina Coastal Reserve comprises sandy beaches fringed by Casuarina trees and sandstone cliffs. The Reserve protects areas of cultural significance, including Old Man Rock, a registered Aboriginal sacred site. The Reserve also features a large grassy area with barbeques and tables. Crocodylus Park  - Only 5 min drive from the airport, the park is home to more than a thousand crocodiles. It also houses exotic birds, primates, big cats and lizards. Children under 4 years have free entry. Adelaide River Jumping Crocodile Cruise to get up close and personal to the crocs. Stop at the Humpty Doo hotel on the way to the Adelaide River and sample the cold beer on offer. Kimberley Outback Tours 214 Coolibah Drive, Kununurra 08 9169 1995 (local), +61 8 9169 1995 (international). Luxury Kimberley tours that include cruises, helicopter rides, and en-suite accommodations. The Northern Territory is a great place to study, with options available in VET courses and apprenticeships, as well as undergraduate and post graduate tertiary study. Institutions are located in and around the Northern Territory’s major centres, so you will always be close to the action to unwind in your down-time. See the Territory Government's website  for information about studying and working in the Northern Territory. A working holiday in the Northern Territory gives you the opportunity to experience a lifestyle and culture that's completely different from the rest of Australia and, in fact, the world. From outback stations and horticultural farms to hospitality and nursing, there are many ways to fund your holiday in the Northern Territory. Automatic Teller Machines are available extensively. Foreign exchange is available at most banks. 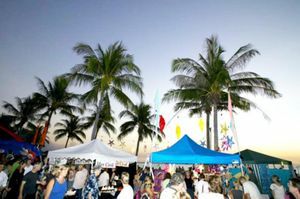 The Mindil Beach Sunset Markets are immensely popular, are by far the largest in the NT and runs from May to October on Thursday and Sunday. They cause the largest traffic snarls and most parking hassle you are likely to encounter in Darwin. Bring a bottle of wine and blanket, find a spot on the sand and watch a famous Darwin sunset. For a sweet fix, try chocolate-filled churros, or a flame-grilled Malaysian satay stick for something savoury. Vegetarians should try the Lucky Cow’s felafel wrap. There are many stalls, heaps of food choices, and even avid market haters will like these markets. Enjoy exotic cuisine, local art, craft and live music. No visit to the Saturday morning Parap Village Markets is complete without a bowl of Mary’s famous laksa, a curry-filled roti wrap or freshly blended fruit juice. On Sunday visit the Nightcliff Markets, start with a visit to the crepe stand for a strawberry and nutella breakfast, while listening to the beat of live music. There are some interesting stalls offering eco-friendly soaps, hemp products and locally designed clothing. Rapid Creek Sunday Market is great for locally grown fruit and vegetables, particularly Asian herbs. Here you can get a Thai massage, or pick up homemade mango chutney and jams. It operates all year round on Sunday morning. Start at Smith Street Mall in the city centre then branch out into the surrounding streets. Travellers will find a range of shopping experiences including local galleries specialising in Aboriginal art or speciality shops selling world-class pearls and crocodile-skin products. Nomad Art, (1/3 Vickers St, Parap), . edit Specialists in Aboriginal art from the Northern Territory, with an emphasis on works on paper. Nomad Art also run a gallery in Manuka, Canberra. Top End Gold Honey - local honey from around the Northern Territory. The flavours vary according to the seasons with a unique taste at every time of year. Darwin’s downtown dining hub encompasses Mitchell and Knuckey Streets and is brimming with restaurants, cafes and pubs. Dinner in Darwin can be classy or casual, but always relaxed. For breakfast, Café Uno serves a tasty toasted avocado, tomato and cheese croissant, and coffee lovers should head to Café 21 in the mall. For something a little different, try the coconut loaf with lemon curd at Roma Bar or French toast with maple syrup and bacon at Ducks Nuts Bar and Grill. Lunch options in the Central Business District are endless. Jump on the sushi train at Go Sushi, people-watch over a Caesar salad at Wisdom Bar & Café or try the crispy roast duck at Roast and Noodle. Enjoy the variety of Tapas at Moorish Café or create your own stir-fry at Magic Wok. There is an array of pubs that serve up fish and chips, burgers and parmas, Shennanigans or the Fox Ale House. For a juicy steak and fine wine visit Char Restaurant @ Admiralty, head to Hanuman for consistently great curry, get your Italian from Giuseppe’s or try mod oz fare matched with a colourful cocktail at Monsoons. The Tap, in the middle of Mitchell St. Sit down and relax and watch the world walk by. Wisdom, Mitchell St. Try the 50 beers on their "Enlightenment through beer" wall, and join a list of esteemed tourists and locals alike. Tim's Surf & Turf located on Litchfield St has good value meals which will no dint your wallet. Watch the barges, sail boats and tinnies out on the harbour or peer over the edge to see moon fish getting their feed from chips dropped by diners. Most of the food served here is picnic style take away. Stir-fried noodles, beer battered barramundi, crumbed calamari and other choices are presented on plastic plates. Make sure you visit the ice cream shop and refresh your palate with a scoop of butterscotch or mint chocolate chip. There is also a more upmarket seafood restaurant on site. 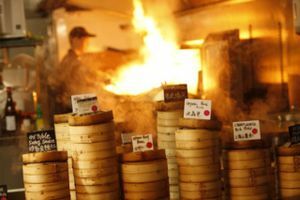 Well-known for its markets, but also has a diversity of lesser-known restaurants. Try sizzling Mongolian beef at The Happy Garden Chinese Restaurant or steaming hot tamales from Prickles then move on to coffee and cake at The Cyclone Café or Paraparazzi. If you want to stock up on gourmet goodies, head to Parap Fine Foods, they’ve got a great deli and stock French home-style bread. Best known for its views and pricey real estate, the assortment of dining in Fannie Bay is considerably less expensive than the housing. You can drink a glass of sparkling with breakfast at Cornucopia Museum Café, but be sure to book, as it is always busy. Across the road is the Darwin Ski Club, where the food is pub-style with harbour views. Try The Cool Spot Cafe, a trendy hangout that offers great light meals and snacks. The seafood dishes are a highlight at Pee Wee’s at The Point, especially the soft shell mud crab. Offers an abundance of seafood choices and expansive harbour views, but you’ll also find Italian, Thai, Greek and French cuisine. Freshly shucked oysters are a specialty at Yots Greek Taverna, try the barramundi at La Beach, succulent battered bug tails from the takeaway fish and chip shop or settle with a glass of sparkling at Buzz Café. There is a large variety of restaurants along the boardwalk overlooking the marina, so you won’t be starved for choice. Darwin has numerous clubs and bars. Also you can check out some local music at Brown’s Mart. Top End Hotel, Mitchell St.
Darwin YHA - Melaleuca on Mitchell  52 Mitchell St, ☎ 1300 723 437, +61 8 8941 7800. Located in the heart of the city, this hostel has all the facilities to keep you cool in the heat. Grab a drink at the bar, laze by one of two pools or chill out under the waterfall spa. Frogshollow Backpackers 27 Lindsay St, ☎ +61 8 8941 2600, toll free-1800 068 686, fax +61 8 8941 0758 ) Dorm-1 Person, $24, or $140 weekly. Room only-2 persons $55-68. The Wilderness Lodge 88 Mitchel St. $24. In an Emergency dial 000 for ambulance, fire or police. Royal Darwin Hospital is one of five public hospitals located within the Northern Territory. 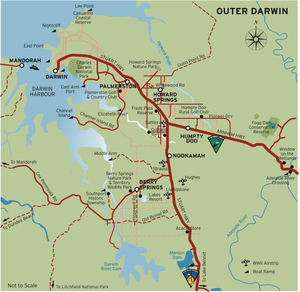 The hospital is on Rocklands Drive, Tiwi, on the northern side of Darwin. As you approach Casuarina, blue signs give directions to the hospital, but it is better to familiarise yourself with the Hospital's location before you may need to find it. Darwin Private hospital is situated across the road. Extensive delays may occur for treatment of anything other than very serious illness or trauma injuries at the Accident and emergency section of Royal Darwin Hospital. Be prepared for a long wait, especially on weekends. Drink plenty of water; at least 1 litre of water for every hour of walking in very warm weather. Ensure you have an adequate fitness level for the bushwalk you plan to undertake. Avoid walking in the hottest part of the day or walking alone, register with the overnight bushwalking register if you plan an extended walk. Carry a map of the area you're walking/camping in and know how to read it, tell someone your plan and when you expect to return. Carry a mobile telephone if in a potential coverage area but do not expect coverage anywhere other than very built up areas with good line of sight to a transponder tower. Under no circumstances should you rely on mobile telephony for essential communications unless within the city area. Ensure you are using a mobile telephone service that provides usable coverage in the Northern Territory. Not all of the service providers give even faintly adequate coverage throughout the Darwin area and much less so outside the immediate city and suburban area. Please see the Driving in Australia article for some useful tips that apply to travelling by road in the Northern Territory. Even locations very nearby to the city can present serious challenges and concerns unless properly skilled and prepared for the conditions. The effects of hot weather and exhaustion can set in quickly if you encounter difficulties. Even if you are successful in raising an alarm for assistance it may still be a long wait before it can arrive. Malaria does not exist in or around Darwin and during the peak of the dry season (the preferred traveling season) Mosquitoes are still present though in areas where there is water. Bring a DEET based repellent, as this will also work on sandflys. Risks arising from Dengue fever should be considered. The Box Jellyfish is a potentially deadly beach hazard between the months of October and May, but less so during the peak travel season. When swimming at local beaches, even in the 'safe' season of June to September, bring vinegar and pour it over the wound if stung. Transport to hospital is a must as the venom of the Box Jellyfish can be deadly - remember CPR. Crocodiles are very common in waterways, but are only occasionally found on public beaches. The local newspaper loves a good crocodile story. If a crocodile is nearby to a public place it will be often in the local media. Never camp near the water's edge. There are safe swimming areas in and around Darwin, but caution should always be practiced- if you are even the slightest bit unsure about an area do not swim. A 6 m crocodile can lie completely invisible for more than 2 hrs in less than 1 m (3 ft) of water, so unless an area has been deemed safe by the local wildlife management, you'd be best to leave it alone. A check with the NT Parks and Wildlife Service will reveal which parks are open, and which are open with swimming prohibited. Many hotels, motels and backpacker lodges have Internet access with special deals for guests. Some accommodation providers have free internet for guests. Local roadhouses increasingly offer internet kiosks. Darwin libraries offer Internet access terminals for AUD$3 per half hour for visitors, and there are variety of Internet cafes around the city. Free wifi (Internode) is available at Darwin Airport, and at the McDonalds restaurant near the airport. Darwin is the gateway to the rest of the Northern Territory. It provides a base for day trips to explore the 'Top End' of Australia. Kakadu National Park is the largest national park in Australia. It contains one of the highest concentrated areas of aboriginal rock art sites in the world, the most famous being at Nourlangie Rock and Ubirr. Katherine is where the outback meets the tropics. Situated about 300 km south of Darwin. The township is situated on the banks of the Katherine River, which flows down from the world-renowned Katherine Gorge (Nitmiluk National Park).There are incredibly diverse landscapes and unique ecosystems set the scene for outback adventure activities like fishing, canoeing, bushwalking, birdwatching, camping and four-wheel driving. Litchfield National Park is a 1,500 sq km park situated an hour-and-a-half drive from Darwin. The Park includes a lot of the Tabletop Range, which is a wide sandstone plateau mostly surrounded by cliffs. Stay for the day or for the more adventurous stay for two or three days. The monsoon season lasts from October to May, the rest of the year is a good time to visit as the waterfalls flow more gently, making the waterholes perfect spots for a cool dip. Main attractions include permanent spring fed waterfalls (Florence, Tolmer and Wangi), cascades at Buley Rockhole, magnetic termite mounds, and a wildlife cruise along the majestic Reynolds River. 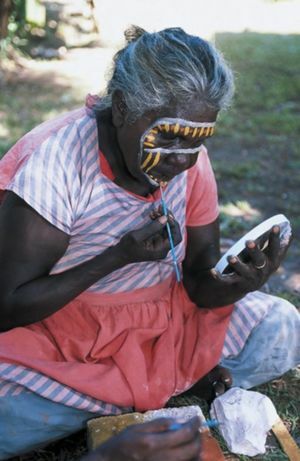 Tiwi Islands are a small archipelago 100 km north of Darwin, famous for Aboriginal culture and art. Only a 20-min flight away, but only accessible via organized tour. 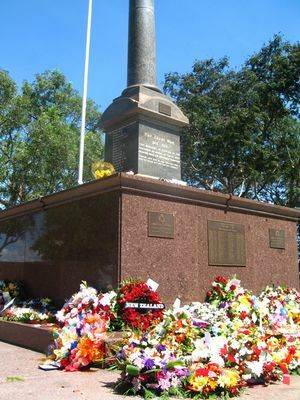 This page was last edited on 15 December 2018, at 18:40.